Call Center Quality Assurance Web-Based Training and Certification Series, 7-part training seminar series, with optional certification exam. Author Gary Goodman identifies core behaviors that make up excellent customer service -- as defined by the customer -- and provides managers with a set of proven tools for promoting and maintaining it, transaction after transaction. Learn the five reasons you should monitor CSR performance, how current monitoring practices fail, the pluses and minuses of customer surveys, how to monitor, what to monitor, and the legal issues surrounding the taping of conversations. This report contains the results of a study of current monitoring practices and policies from 735 national and international call centers, including written comments to survey questions and the call center management review's special issue on monitoring and coaching. 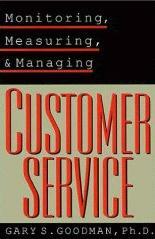 Copyright © 1999-2010 Resource Center for Customer Service Professionals LLC. All rights reserved.